The Doll is based on the figure of the seated girl within the engraving Les oiseaux Attaches after Gravelot, see ECC Transactions 3 (1) plate 22d. On the other side of the mug is a print known as Bubbles. 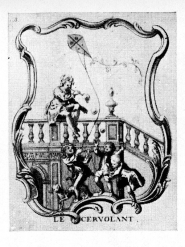 Bubbles is based upon the figure of the seated boy in the engraving Le cervolant after Gravelot, see ECC Transactions 3 (1) plate 22a. 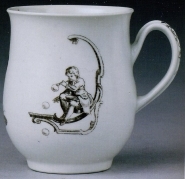 This Worcester mug is printed in black enamel with two prints of children seated within rococo scrolling. Prints of two butterflies appear between the main prints. The print of the girl playing with her doll is known as The Doll. It comes from a series of engravings of children's' games after Gravelot. These were identified by Cyril Cook, who considered the ceramic prints to be the work of Robert Hancock, see ECC Transactions 3 (1) pp 54-62.